Most people believe lifting weights or extreme workouts is the only way to achieve results. TRX training is an exercise method shown to improve total body strength, stability, and cardiovascular health. This is done without traditional weight lifting, swinging kettlebells, or lifting semi-truck tires. The TRX system was developed by a Navy Seal over 20 years ago and since has captured the attention of athletes, coaches, and trainers. It continues to grow as an effective program used by professional athletes, every branch of the military, Olympians, and gyms worldwide. Their social media is impressive, with over one million followers. What is it about the TRX System that has made it popular among athletes and mainstream fitness enthusiasts as an effective workout? Learning about how it works will help answer that question and more. TRX is short for total body resistance exercise and uses suspension training for a complete, full body workout. According to the TRX website, suspension training is for everyone. It uses simple equipment and provides effective workouts. All you need is the TRX Suspension Trainer and your body weight. TRX HOME2 – Endless bodyweight workouts you can do at home or on the road. Access to premium TRX application included with purchase. TRX PRO4 – Used by Olympians, pro athletes, and fitness fanatics. Most advanced and versatile suspension trainer designed for challenging bodyweight workouts. Includes adjustable foot cradles, textured rubber handles, and upgraded webbing. TRX TACTICAL – Built for the tactical professional and dedicated athlete. Toughest and most rugged suspension trainer made for use in any and all environmental conditions. The complete and challenging fitness regimen includes a 12-week conditioning program designed to prepare you for any mission. TRX RIP TRAINER – Challenging and versatile weighted bar and bungee system. Designed to improve balance, build rotational power, and increase stamina and core strength. Great workout for golfers, climbers, college athletes, or weekend warriors. Suspension training works by challenging your body in conditions of instability. This forces you to constantly engage your core to perform each exercise. It also helps improve your balance and overall strength. You are suspended from an anchor point where bodyweight becomes your machine and gravity your resistance. Adjusting the level of difficulty per exercise is as easy as moving your hands or feet. TRX suspension training uses a simplified approach based on seven basic movements: Push, pull, plank, rotate, hinge, lunge, and squat. Suspension training uses body weight and movement that stimulates neuromuscular responses to body position changes. For example, using an SF body position and lifting your body weight toward the anchor point with a pulling movement engages several muscle groups. Your core is engaged to balance the body while your back and biceps work to pull your body toward the anchor. Your body is working hard integrating strength, mobility, and balance during one dynamic movement. This means you are able to maximize neuromuscular response for better workout benefits. Because suspension training challenges so many muscle groups during an exercise session, it’s said to provide superior workout results. TRX Suspension Training claims to be an effective workout program. 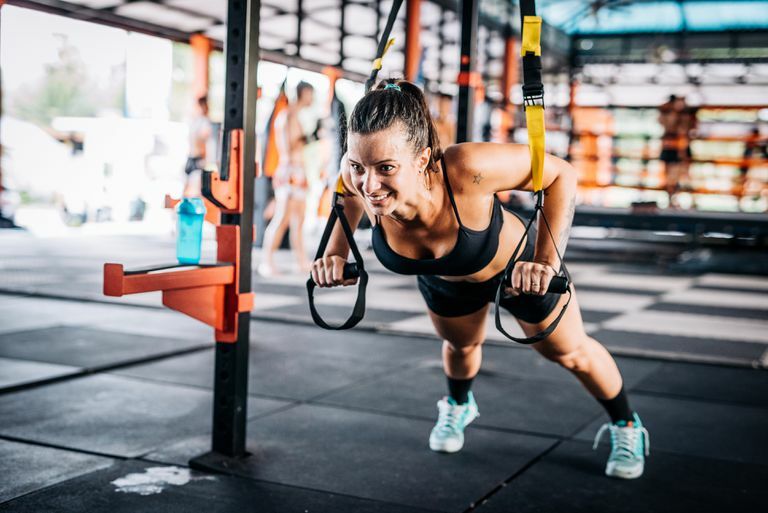 A small scientific study sponsored by the American Council on Exercise (ACE) indicated TRX training is a good alternative to traditional exercise modalities. According to the ACE research, improvements were also made in cardiovascular and muscular fitness in only eight weeks. Combined with the balance and flexibility benefits, suspension training was said to have the potential to create a positive impact on an individual’s overall health. Another study examined muscle activation during push-ups with different suspension training systems. Research volunteers included 29 young fit male college students who routinely used suspension training as part of their workout program. Results showed all training systems effectively engaged the abdominal muscles. Greater activation of the traps, triceps, lumbar, and quadriceps was achieved with more unstable suspension devices like the TRX training product. However, the best deltoid and pectoralis (chest) muscle activation was achieved with more stable suspension training conditions. Other research compared different levels of interval training using TRX lower-body exercises and impact on fall risk in healthy older adults. Participants included 82 men and women over 68 years of age. They were divided into three groups performing high-intensity interval training (HIIT) or moderate intensity interval training (MIIT). Both groups gained balance confidence but the HIIT participants using TRX lower body suspension training scored better regarding fear of falling, improved gait, and dynamic balance. TRX training challenges several muscle groups during each exercise movement. Your standard push-up for the chest also engages the core and other muscles during suspension training. Your center of gravity is always out of balance, leaving no choice but to engage your core, back, hips, and shoulders to stabilize the movement. This means that performing regular exercises like squats, planks, and push-ups become more dynamic because other muscle groups are working to support the move. Many people believe lifting weights is the only way to build muscle and strength. These same individuals find it hard to imagine that hanging on straps could offer the same results as traditional resistance training. You may be surprised to know both exercise methods appear to be great options to achieve these goals. Studies have shown TRX training to be an effective way to build muscle, strength, improve stability, and cardiovascular health. It really comes down to exercise preference and what keeps you coming back for more workouts. Research published in the Journal of Sports Science and Medicine indicates TRX training produces similar muscle and strength adaptions as traditional weight lifting. Jumping ability – greater increase in TRX training group compared to the traditional resistance training group. Back squat – leg strength increased by 13 percent in the TRX group compared to 12.6 percent in the traditional resistance training group. Bench press – one rep max strength increased by 4.7 percent in the TRX group compared to 4.4 percent in the traditional resistance training group. Both TRX training and traditional weight lifting are shown to have positive benefits. What has been suggested is for athletes to apply TRX training as an option to further improve sports performance including gains in strength, power, and jumping capacity. Many regular exercisers incorporate both traditional weight lifting and TRX training as part of their workout regimen. Alternating the training is said to be a good way to work your muscles in stable and unstable conditions. TRX training includes adjustable suspension bands suitable for the novice exerciser to advanced athlete. This means the program can be modified to fit every fitness level. The variety of exercises and progressions for each movement are endless, making TRX suspension training not only appealing but beneficial for everyone. If you are a beginner and unfamiliar with exercise, it may be a good idea to work with a qualified personal trainer or certified TRX coach until you feel comfortable. Developing your weight lifting skills in a stable environment may be recommended before moving to the instability benefits of suspension training. TRX Suspension Training continues to grow as a popular exercise method to gain strength and stability. As with any workout program, there will be likes and dislikes. It really comes down to personal choice and enjoyment of suspension training—you either love it or you don’t. TRX training is a challenging way to accomplish a total body workout. The exercises and progressions are almost limitless, making it a great alternative for the beginning exerciser to advanced athlete. The following circuit is just one of the many ways to complete a full-body suspension training workout. Warm up for about 6 minutes. Stretch lightly. Repeat circuit 2 to 3 times, allowing 30-second rest between sets. TRX Suspension Training uses bodyweight, movement, and gravity for a challenging and effective workout. Each exercise is performed in unstable conditions, forcing you to engage your core and other muscles to stay balanced. The neuromuscular responses that occur during the workout help build strength and stability. The system is designed for beginning exercisers to advanced athletes and continues to grow as a popular exercise method. If you’re considering TRX training and are new to exercise, workouts performed in stable conditions is recommended before adding the instability of suspension straps. It may also be a good idea to enlist the guidance of a qualified personal trainer or TRX coach. Before starting this or any other fitness program, you should consult your physician or other health care professional to determine if it is right for you. Calatayud J, Borreani S, Colado JC, et al. Muscle Activation during Push-Ups with Different Suspension Training Systems. J Sports Sci Med. 2014. Dannelly BD et al. The effectiveness of traditional and sling exercise strength training in women. Journal of Strength and Conditioning. 2011. Gaedtke A, Morat T. TRX Suspension Training: A New Functional Training Approach for Older Adults - Development, Training Control and Feasibility. Int J Exerc Sci. 2015. Jiménez-García JD et al. High-Intensity Interval Training Using TRX Lower-Body Exercises Improve the Risk of Falls in Healthy Older People. Journal of Aging and Physical Activity. 2018. José Luis Maté-Muñoz et al. Effects of Instability Versus Traditional Resistance Training on Strength, Power and Velocity in Untrained Men. Journal of Sports Science and Medicine. 2014. Leslie E. Smith et al. Acute and Chronic Health Benefits of TRX® Suspension Training®. American Council on Exercise sponsored study. 2016.